Government in southwest Russia; separated by the Pruth and Danube from Rumania on the west, by the Dniester from Podolia and Kherson on the north and east, and bordering on the Black Sea from the Sulina mouth of the Danube to the estuary of Ovidiopol. The population in 1889 was 1,628,876, the Jews numbering 180,918. In 1897 the population was 1,936,392, of whom 225,637, or 11.65 per cent, were Jews. According to statistics of the Jewish Colonization Association, the Jewish population in the cities in 1898 was 173,641. Official documents show that Jews first emigrated to Bessarabia from Poland and Germany in the sixteenth century. They settled there in great numbers, not being permitted to live in the neighboring principality of Moldavia. At the present time a considerable part of Bessarabia is forbidden ground for the Jews, the May Laws of 1882 being administered in a hostile spirit by the local authorities, who have officially declared their towns to be "villages" in which no Jews may reside. 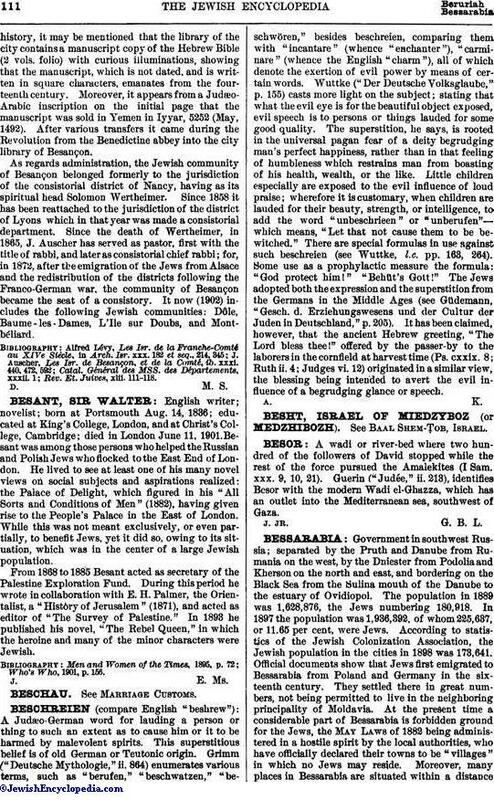 Moreover, many places in Bessarabia are situated within a distanceof fifty versts (33 English miles) from the frontier; and here only such Jews are permitted to live as were registered there before the issue of the edict of 1858. Bessarabia excels among the Russian governments in the culture of the vine; and in this, as in the cultivation of tobacco, large numbers of Jews are employed. The chief articles of export are grain, fruit, and wine. Government of Bessarabia (Census, 1897), Jewish Population. Per Cent of the Total Population. Russian Census, 1897 (by courtesy of Baron David Günzburg). H. R. S. J.Proposed Colony of 1840. In the year 1840 David Zelensky of Krementchug, Joseph Rabinovitch of Pavlograd, and Jacob Goldenweiser of Uman presented a petition to Count M. S. Vorontzov asking for his cooperation in the realization of their plan for the founding and organization of a Jewish agricultural colony in Bessarabia. The unsatisfactory condition of Jewish agricultural colonies established before that time was due, they said, to the social and religious conditions of the Jews, to the habits forced upon them by many centuries of artificial life, and to the deep-rooted prejudices against them. 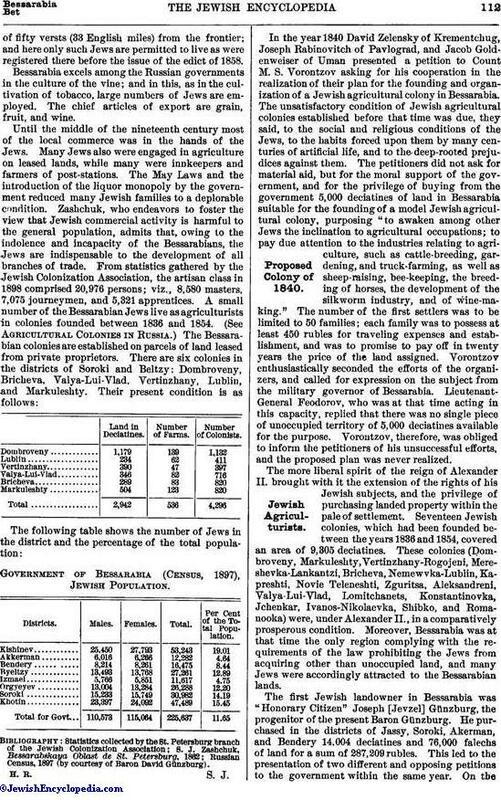 The petitioners did not ask for material aid, but for the moral support of the government, and for the privilege of buying from the government 5,000 deciatines of land in Bessarabia suitable for the founding of a model Jewish agricultural colony, purposing "to awaken among other Jews the inclination to agricultural occupations; to pay due attention to the industries relating to agriculture, such as cattle-breeding, gardening, and truck-farming, as well as sheep-raising, bee-keeping, the breeding of horses, the development of the silkworm industry, and of wine-making." The number of the first settlers was to be limited to 50 families; each family was to possess at least 450 rubles for traveling expenses and establishment, and was to promise to pay off in twenty years the price of the land assigned. Vorontzov enthusiastically seconded the efforts of the organizers, and called for expression on the subject from the military governor of Bessarabia. Lieutenant-General Feodorov, who was at that time acting in this capacity, replied that there was no single piece of unoccupied territory of 5,000 deciatines available for the purpose. Vorontzov, therefore, was obliged to inform the petitioners of his unsuccessful efforts, and the proposed plan was never realized. The more liberal spirit of the reign of Alexander II. brought with it the extension of the rights of his Jewish subjects, and the privilege of purchasing landed property within the pale of settlement. Seventeen Jewish colonies, which had been founded between the years 1836 and 1854, covered an area of 9,305 deciatines. These colonies (Dombroveny, Markuleshty, Vertinzhany-Rogojeni, Mereshevka-Lankantzi, Bricheva, Nemewvka-Lublin, Kapreshti, Novie Teleneshti, Zguritsa, Aleksandreni, Valya-Lui-Vlad, Lomitchanets, Konstantinovka, Jchenkar, Ivanos-Nikolaevka, Shibko, and Romanooka) were, under Alexander II., in a comparatively prosperous condition. Moreover, Bessarabia was at that time the only region complying with the requirements of the law prohibiting the Jews from acquiring other than unoccupied land, and many Jews were accordingly attracted to the Bessarabian lands. The first Jewish landowner in Bessarabia was "Honorary Citizen" Joseph [Jevzel] Günzburg, the progenitor of the present Baron Günzburg. He purchased in the districts of Jassy, Soroki, Akerman, and Bendery 14,004 deciatines and 76,000 falechs of land for a sum of 287,209 rubles. This led to the presentation of two different and opposing petitions to the government within the same year. On theone hand, a group of Jewish capitalists in St. Petersburg petitioned for permission to purchase land occupied by freedmen, and for all the privileges conferred upon non-Jews through the territory within the pale of settlement, with the provision that neither the Jewish owners nor any of their coreligionists should sell spirituous liquors. On the other hand, the nobles of Bessarabia petitioned the government to enforce the old laws prohibiting Jews from purchasing or owning any land in Bessarabia. A. G. Stroganov at first decided the case against the Jewish petitioners, and the military governor, General Ilyinski, also reported unfavorably. Notwithstanding this, however, the czar (March, 1859) decided in favor of the Jews, who showed that the land had increased in value. The timber trade, which, at the beginning of the nineteenth century, was not an unimportant factor in the life of New Russia, owed its growth and prosperity to foreign Jews. 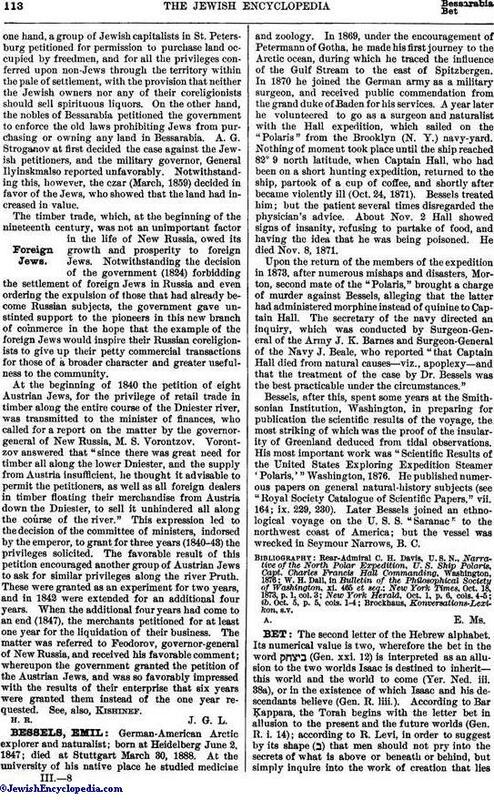 Notwithstanding the decision of the government (1824) forbidding the settlement of foreign Jews in Russia and even ordering the expulsion of those that had already become Russian subjects, the government gave unstinted support to the pioneers in this new branch of commerce, in the hope that the example of the foreign Jews would inspire their Russian coreligionists to give up their petty commercial transactions for those of a broader character and greater usefulness to the community. At the beginning of 1840 the petition of eight Austrian Jews, for the privilege of retail trade in timber along the entire course of the Dniester river, was transmitted to the minister of finances, who called for a report on the matter by the governor-general of New Russia, M. S. Vorontzov. Vorontzov answered that "since there was great need for timber all along the lower Dniester, and the supply from Austria insufficient, he thought it advisable to permit the petitioners, as well as all foreign dealers in timber floating their merchandise from Austria down the Dniester, to sell it unhindered all along the course of the river." This expression led to the decision of the committee of ministers, indorsed by the emperor, to grant for three years (1840-43) the privileges solicited. The favorable result of this petition encouraged another group of Austrian Jews to ask for similar privileges along the river Pruth. These were granted as an experiment for two years, and in 1842 were extended for an additional four years. When the additional four years had come to an end (1847), the merchants petitioned for at least one year for the liquidation of their business. The matter was referred to Feodorov, governor-general of New Russia, and received his favorable comment; whereupon the government granted the petition of the Austrian Jews, and was so favorably impressed with the results of their enterprise that six years were granted them instead of the one year requested. See, also, Kishinef.